Amana 30" freestanding electric range with 4 elements. This range offers a 4.8 cu.ft. 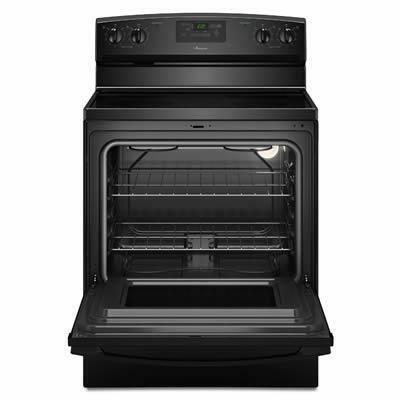 oven capacity and features, easy touch electronic controls and storage drawer. 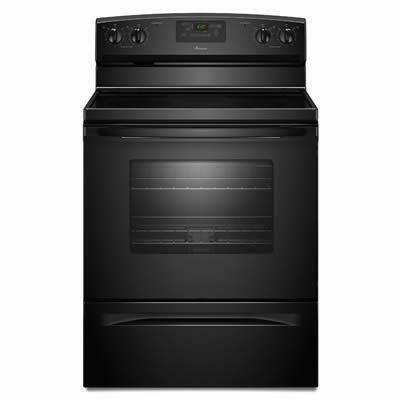 Additional Information SpillSaver Ceramic Glass Upswept Cooktop; Easy Touch Electronic Controls; Extra-Large Oven Window. Burners/Elements Output Left Front Power: 2,000 Watts; Left Rear Power: 1,500 Watts; Right Front Power: 1,500 Watts; Right Rear Power: 2,000 Watts. Burner/Element Size 8", 8", 6", 6".